For the last few decades Moore’s Law has continually provided exponential growth in the number of transistors on a single chip. This chapter describes a class of architectures, called tiled multicore architectures, that are designed to exploit massive quantities of on-chip resources in an efficient, scalable manner. Tiled multicore architectures combine each processor core with a switch to create a modular element called a tile. Tiles are replicated on a chip as needed to create multicores with any number of tiles. 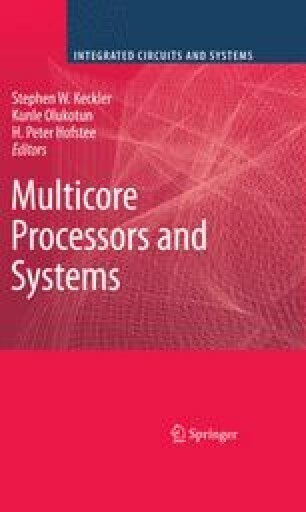 The Raw processor, a pioneering example of a tiled multicore processor, is examined in detail to explain the philosophy, design, and strengths of such architectures. Raw addresses the challenge of building a general-purpose architecture that performs well on a larger class of stream and embedded computing applications than existing microprocessors, while still running existing ILP-based sequential programs with reasonable performance. Central to achieving this goal is Raw’s ability to exploit all forms of parallelism, including ILP, DLP, TLP, and Stream parallelism. Raw approaches this challenge by implementing plenty of on-chip resources – including logic, wires, and pins – in a tiled arrangement, and exposing them through a new ISA, so that the software can take advantage of these resources for parallel applications. Compared to a traditional superscalar processor, Raw performs within a factor of 2x for sequential applications with a very low degree of ILP, about 2x–9x better for higher levels of ILP, and 10x–100x better when highly parallel applications are coded in a stream language or optimized by hand. We thank our StreamIt collaborators, specifically M. Gordon, J. Lin, and B. Thies for the StreamIt backend and the corresponding section of this chapter. We are grateful to our collaborators from ISI East including C. Chen, S. Crago, M. French, L. Wang and J. Suh for developing the Raw motherboard, firmware components, and several applications. T. Konstantakopoulos, L. Jakab, F. Ghodrat, M. Seneski, A. Saraswat, R. Barua, A. Ma, J. Babb, M. Stephenson, S. Larsen, V. Sarkar, and several others too numerous to list also contributed to the success of Raw. The Raw chip was fabricated in cooperation with IBM. Raw is funded by DARPA, NSF, ITRI, and the Oxygen Alliance. J. McCalpin. STREAM: Sustainable Memory Bandwidth in High Performance. Computers. http://www.cs.virginia.edu/stream. J. E. Miller. Software Instruction Caching. PhD thesis, Massachusetts Institute of Technology, Cambridge, MA, June 2007. http://hdl.handle.net/1721.1/40317. M. B. Taylor. Deionizer: A Tool for Capturing and Embedding I/O Calls. Technical Report MIT-CSAIL-TR-2004-037, MIT CSAIL/Laboratory for Computer Science, 2004. http://cag.csail.mit.edu/∼mtaylor/deionizer.html.